The Supreme Court has suspended membership of provincial assembly members Shaukat Aziz Bhatti (PP-4) and Khawaja Islam (PP-72) in fake degree cases. A three-member bench headed by Chief Justice Ifitikhar Muhammad Chaudhry resumed hearing of parliamentarians fake degree case. Chief Justice remarked that implementation on article 62 and 63 of the constitution should be made certain. During hearing, Election Commission was of the view that an FIR had been registered against Shaukat Aziz Bhatti in fake degree case. Chief Justice asked why the Election Commission did not de-notified the accused. Special measures should be taken in order to implement on articles 62 and 63 of the Constitution of Pakistan in true spirit. Wahid Anjum, the counsel on the part of Shoukat Aziz Bhatti told the court that his client submitted post-graduate diploma rather than degree of BA. After five days, his client also had submitted certified copy of the diploma. 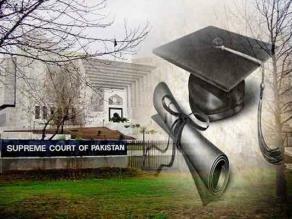 Justice Sheikh Azmat asked, “Did you submit the equal certificate of this diploma”. Moreover, Samina Khawar’s counsel, Tariq Mehmood, argued that Election Commission being a constitutional institution can’t use its freewill. Justice would be delivered from down to up rather than up to down. He also argued that trial regarding degree is underway and it should be continued till final judgment. He also requested the court that notice regarding case should be cancelled. Higher Education Commission told the court that Rafah University has declared the BBA degree as fake. Chief Justice said that Samina Khawar has shown her BA Home Economic when she had submitted her nomination papers. According to Vice Chancellor of the university, the second degree of Samina Khawar has been declared fake.